Are you interested in how the Children´s Initiative Plant-for-the-Planet was founded and what the vision of thousands of children is? Watch this video to find the answer. The Kenyan environmental activist, Wangari Maathai, was the inspiration for the Plant-for-the-Planet campaign. 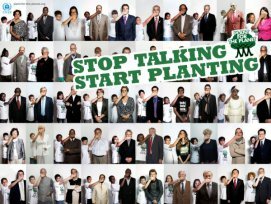 The tree planting campaign was started by nine year old Felix Finkbeiner in Germany in 2007 after he had read about Wangari and the Green Belt Movement she had established in Kenya. The UN Billion Tree Campaign, also inspired by Wangari Maathai, was handed over by United Nations Environment Programme (UNEP) to Plant for the Planet in 2011. The campaign supported by the United Nations Environment Programme (UNEP) and inspired by Wangari Maathai, encourages people around the globe to make a tree planting pledge online with the collective goal of planting at least one billion trees worldwide each year. 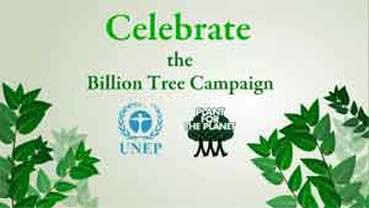 The Billion Tree Campaign was handed over to the Plant for the Planet Foundation 7 December 2011. The handover ceremony was held during the United Nations Climate Change Conference (COP17) in Durban, South Africa. "We children are now keeping the official tree counter of the Billion Tree Campaign and will work together with governments, companies and the public so that the campaign continues to prosper. We take over this task with the utmost commitment and we will do everything to ensure Wangari Maathai's legacy further branches out." ﻿﻿A Plant-for-the-Planet initiated study has found that 9.5 billion trees are lost each year due to deforestation. This is despite the efforts of the Billion Tree Campaign. The study published in Nature in September 2015 also estimates that there are 3.04 trillion trees on Earth, about 7.5 times more than previously estimated. But the total number of trees has plummeted by 45.8% since humans first began transforming the global landscape. Plant for the Planet Foundation members spoke at the World Climate Change Conference 2015 (COP21) in Paris in December 2015. As countries sign up to new tree and forest preservation figures, the target for the Billion Tree Campaign becomes a Trillion Trees! Plant for the Planet gave away bars of Change Chocolate, as one of the 'climate friendly' products at the conference. Change Chocolate was designed to help cocoa farmers and offset the CO2 emissions produced by manufacturing chocolates. Income from the sale of the chocolate is used to give cocoa farmers fair wages and for the planting of trees. The chocolate tagline: A sweet invitation to support Climate Neutral Now and the biggest afforestation project ever.